US appears to be putting together a team for this server as well. If all the teams stated they would join do, it is likely there is going to be some overlap in quads. Fun times! How will we know this without a merged domain place to discuss on here? We need a section on the forums to get in trouble on. Whilst I have my own thoughts, that part of the conversation has already been outlined in the server announcement. It'll happen once the existing game worlds for each of the separated domains has ended. Given we're all posting on UK already, perhaps a gentlemanly agreement to continue posting about the combined server on UK will suffice? Create a thread, and I will make similar with redirection-links to the other domains until we also have a merged domain here on forum. At the moment, it could be an idea, to choose AU, UK and US under Settings too, then it's also easy to subscribe to a thread or threads you want to follow. Let me know if I can be any help here. As I am sure you have heard I have al the domains set already, I was just hoping there was an easy spot for everyone involved to go to start the discussions. I would start it up but I didnt know where to put it. UK, US, AU, COM. I am not allowed to start a thread in all of them anymore so I guess Ill just wait until the newly named area is opened I guess. Post was edited 1 time, last by jaruby ( Oct 7th 2018 ). Exactly. Why is it so difficult to get an official spot for all of this? This is largely speculation however I believe they want to avoid the confusion of running the combined language pack at the same time as existing AU/UK/US ones. I don't think there is any real technical challenge, rather the issue is in how to handle the currently running servers on those language packs. There are 10 active servers I think that share the same domain number. The only real work is in moving over all the threads, which shouldn't be that difficult depending on what the Mod tools look like. (simply various levels of time consuming). Though I suppose there may be some technical issue in making all the current AU/UK/US language users also users of the new language pack. That said, I think it is entirely possible to create the merged language pack now. The troubles of servers with the same number can be avoided through something as simple as having Mods (I know extra work sorry) add an identifier to each thread name in the Embassies. I.e [US1] Random Chatter or [UK1 BR Thread. I think it can all be done relatively easily (growing pains to be expected and a little work to do it) but Travian moves at its own pace. So even if the staff on the ground are capable of doing it, they may well need to wait for word on high to actually get something done. Hence why I asked for clarification though. I want to be sure my understanding of the timing is correct and get an understanding as to why. Then we can merrily raise our concerns and fight for a better solution if need be. 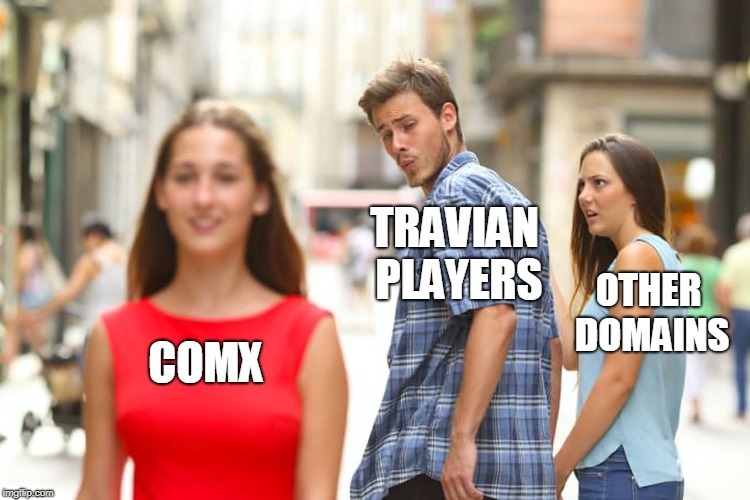 I agree a combined forum would be a lot better for the start of this exciting new server but I'm not sure the time frame will allow Travian Games to actually sort anything out even if they wanted to. We all know they operate at a "steady" pace. So new language pack won't be implemented until the existing game world has ended, as far as I can understand. I do understand you all have a lot questions, but at moment the information that ameno gave, is all we have. We collect your questions and concerns, and as soon as we have more information, we will share this with you. I don’t see why we can’t just get a merged forum now, and just move all the current threads from the 3 domains to that one, so we have all threads in one place? And then give us the ability to set the tag on the thread as “UK”, “US”, “AU” or “English” or whatever the merged server is gonna be called. As much as I hate agreeing with lemon and how annoying all the new threads from other domains will be, I reckon he is right. @Lemon and @notorious crunchie, we will bring your wish forward, when we do our weekly report. Okay 29th it is, merged server is a good idea and hopefully it will attract enough to create a decent server! And for those who don't wish to join a small group of players who are very clicky and will use you just as their pawns for their own needs then hit me up. Or from 99.9% of the people who have actually played in AA "A group of friendly players who don't use anyone but do everything we can to help any member big or small"